Have you ever been at the marvelous Gold of Africa Museum in Cape Town with its stunning collection of gold artefacts from West Africa? If you have not been there yet, then this little museum is a must see when in Cape Town as it is really a gem! It is sparkling with golden artefacts and extraordinary delicate goldsmithing can be admired. In fact, this Cape Town museum houses the world’s most comprehensive collection of treasures from the gold-rich kingdoms of West Africa. South Africa might be the foremost supplier of gold nowadays, but a long time ago most of the gold supplies came from the Akan states in West Africa. And the Cape Town Gold museum explains the rich tradition of gold in African society. 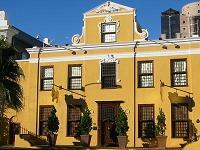 The Gold of Africa museum is housed in the beautifully renovated Martin Melck House in Strand Street close to the Dutch Embassy. The house is painted in a bright golden-yellow colour, so you really can not miss it. The Martin Melck House was actually built in 1781, at the same time as the Ashanti Kingdom in west Africa was at its height and then stood close to the Cape Town waterfront, which is hard to imagine now. After having visited the museum various times and recently also for the excellent "Threads of Africa" exhibition , my family and I went to explore the excellent museum again while taking part in a night tour at the Gold of Africa museum. The Pangolin Night Tour really is a treat for the whole family! When we arrived for the evening tour, we were welcomed by friendly museum staff with cold drinks for the kids and glasses of white wine for the parents. The welcome drinks were decorated with little flakes of goldleaf. A stilt walker was also there to greet us. What a great start to a museum tour! We were then led by the very knowledgeable museum guide around the exhibition. For the night tour all of us got small torches to go on search of some hidden treasures in the darkened museum’s exhibition rooms upstairs. It was fascinating to hear our guide telling so many stories, learning historical facts and seeing him getting the kids to participate and share thoughts about the importance of gold in the African kingdoms. The guide himself being the son of one of the kings of Cameroon, explained many exhibits in detail and told the children many fabulous stories. So it was really special to have an insiders’ view about life in an African kingdom. In the exhibits there are lots of historical maps showing the gold trade routes and locations of the gold-rich kingdoms of Western Africa, explaining about the historical importance of the gold trade. The golden artefacts and gold jewellery in the main exhibition room are stunning examples of the highly skilled goldsmithing of that time. Amongst the many beautiful artefacts, there are golden ear rings, one pair weighs more than 600g - more than a pound, there is a golden helmet decorated with horns, a golden flywhisk, several rings decorated with tiny golden animals and heavy golden bracelets which were worn by the kings during official ceremonies. Our guide took a lot of time to explain passionately the various exhibits and so in the end the kids were sad when we had to say good-bye to our guide after having stretched the 60 minute tour already to more than 90 minutes. The kids simply wanted to hear more and more of the very interesting stories and fascinating explanations the guide could tell. Many thanks go to Arouna Melo for a really special great tour! And you are right learning about history and visiting museums can indeed be so much fun! So have some great time out in Cape Town, the Pangolin Night Tour in the Gold of Africa Museum comes highly recommended! Parking: For the evening tours you can easily find parking in the adjoining streets and as there is security watching the area you do not have to worry about your or your car’s safety. During the day I would recommend to park in nearby Strand Arcade, a covered multi-storey parking or nearby parking at Buitengracht. Streetparking is also an option, so you have to pay a park guard and get a receipt from him. Shopping: If you like to get more info about the History of the Gold of Africa, then I recommend to get the little booklet: “Gold of Africa – A History of the Gold of Africa For Schools” from the Museum Shop. It is a concise and easy read as it was written with teenagers in mind. 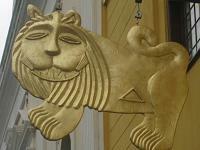 It gives a good introduction to the museum and about the history of goldsmithing in Africa.